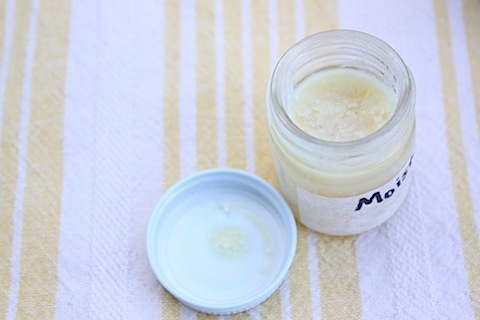 I realize my series on natural products has been slacking a bit, but today I’m sharing something to make up for it – an awesome recipe for a homemade facial moisturizer that I absolutely adore. Seriously, this stuff is amazing! 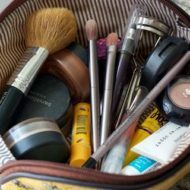 I have dry, sensitive skin so I have to be careful what products I use, particularly on my face. With this homemade cream, I’ve finally found something perfect for my skin type. I use it all year long but it’s especially nice in the winter months since my skin tends to be more dry than normal. Although I think it would be great as a daily moisturizer, it doesn’t have SPF so I stick with a sun protecting cream during the day. Currently I’m using A Perfect World SPF 25 from Origins and I’m liking it. Since I made the switch from my previous night-time moisturizer (CeraVe) to this homemade blend, I’ve noticed a big difference in how smooth and soft my skin is when I wake up in the morning. It’s glorious! I’ve also noticed that the moisturizer isn’t just lovely for the face – it can be used all over the body. I put it on my hands, knees, feet, elbows and anywhere else I’m feeling dry. The best part is that the blend is made up of only three natural ingredients, which happen to be packed full of antioxidants -perfect for protecting against free radicals and keeping your skin silky smooth! I’ll also note that a little bit goes a long way. One batch tends to last me a couple months. Another plus – it smells delicious from the coconut oil and cocoa butter. Melt coconut oil first by sticking your container/jar in a bowl of hot water. Combine all ingredients in a small pan or double boiler and heat just until the cocoa butter melts. Allow mixture to cool slightly, place in a small sealed container/jar and shake vigorously, let it sit for a few minutes and shake again. Depending on the temperature, the mixture may solidify similar to how coconut oil/cocoa butter do on their own. In the winter the cream will usually be solid. You just have to use your finger to get a little bit out of the jar, rub it around in your palms or between your fingers to warm it up a bit and then apply. Make a batch for yourself and apply it each night after washing your face. Or make a batch for a friend – a small jar of this makes a great homemade holiday gift. I use straight-up Coconut Oil as my face moisturizer and I LOVE it. I’m somewhat breakout-prone so I was worried about slathering oil all over my face, but it honestly makes me break out far less than any store-bought moisturizers (even the expensive ones…) and it’s SO much cheaper. Hi Kristina, Do you use the coconut oil during the day too or just at night? Does it leave the skin greasy and oily? I want to try it out 🙂 Thanks! Tiffany – I mostly use it at night, and use a tinted moisturizer during the day. I only use a small amount and it absorbs very quickly – my skin never feels oily or greasy after it sinks in or in the morning. I’ve never used it during the day but I imagine you probably could. I use coconut oil morning and night and it’s good on fresh shaven legs! Also i no longer have cracked heels…works like a charm on those nasty heels! Hey Tiffany, it would probably be okay to use during the day if you have dry skin, but not so great if you’re going to be outside in the sun. Coconut oil is a great sunscreen also. I use it straight up every morning. Native Hawaiians have used this throughout time for sun protection! I use it, just a little bit on my fingertips, while my face is still wet from the shower or washing. It thins out the oil nicely, making it spread evenly on my face, and it makes it absorb into my skin faster, with no greasy slick. I love straight coconut oil on my skin all over after a shower, but I will try this creme for my face. I have very sensitive skin and can’t use anything over the counter for my face. Coconut has anti-bacterial properties so it helps heal your blemishes and keeps skin clear. What a great idea! How long would you say this would be good for? Also enjoy Florida! I’d say 2-3 months – no refrigeration is necessary. love this idea. 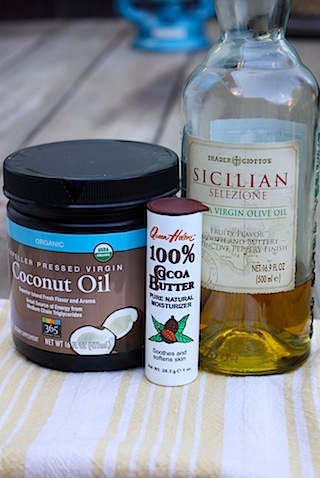 i’ve heard so much about using coconut oil as moisturizer, i just haven’t tried it yet! I have combination skin (very dry after washing but gets oily throughout the day.) Would this be too oily for my skin type to you think? Does it feel greasy after application? I’d think it would be fine during the fall and winter months. It usually doesn’t feel greasy to me because my skin absorbs it quite fast. add some cornstarch to the coconut oil-I have started a small business making coconut oil body creams and they are delicious and make your skin super soft-please contact me-I would love to send you one!!! How much cornstarch? I just started making my own deodorant out of coconut oil and 4 other ing in my cupboard and it works!! I was so thrilled!! Let me know what you’ve got brewing… I am very interested in the natural homemade way!!! Wow I am very interested in how you made you own deodorant. Please could you let me know how you made it. Hi, I was reading your comment about your moisterizer recipe. Would you be willing to share it with me? I am in my 50’s, get occasional breakouts but generally have combination skin and some wrinkles starting. I itch from most store bought products plus I can’t afford them anymore. I would appreciate any help. Also looking for a good cleanser recipe. Hello Wendy I’m from Ireland..Is that possible if you can send me this homemade face cream to Ireland because my skin is very sensitive and I can;t use any lotion or cream I ever bought in supermarkets or pharmacies. ButI wud luv to give it a go to your natutal home made cream..Plz let me know how much will be the expenses for that. I also have sensitive skin and have to be really careful with my face products. At night I’ve been using a little jojoba oil and find that it’s super moisturizing and doesn’t make me break out. I was initially terrified of putting oil on my face, but it’s been awesome. I can’t wait to try your moisturizer recipe! Love the smell of coconut! This looks so simple, I definitely want to try it out. My skin dries out in the winter too so this sounds perfect. Quick question though…the amount in the directions lasts you a couple months? Seems like such a small amount to last that long. A little bit really does go a long way. I only use a small pinch each night. I have dry, sensitive skin, too so I cannot wait to make this tonight!! Thank you!! My esthetician was telling me that it is actually better to use a moisturizer and a sun screen/SPF separately rather than as a combined product. She said that they work, but each product has to give a little something up to be combined, she likened it to the 2in1 shampoo/conditioners–they work, but not as well as using the two products separately. So excited to try this! Thanks for posting. Generally I just use raw unrefined shea butter (which I love) but I am always willing to add a bit of variety to the mix. I’ve been using Trader Joe’s brand of moisturizer, and I like it, but would prefer something even more natural. I’m going to put cocoa butter on my store list! this is such a great idea! i usually use just coconut oil on my hands/etc when my skin is dry but the addition of the olive oil and cocoa butter sounds super moisturizing – which i think my poor dry hands might need desperately right now! Oh yes, my hands are the same way. I’ve been getting paper cuts left and right! This sounds great! 🙂 Thanks for sharing! My skin is super sensitive so I also use CeraVe and love it but I’ve been searching for something very natural. Can you use this during the day as well? or would it be too oily? Thanks! I bet this smells amazing 🙂 I’ve used olive oil on my face before by itself and it made my skin soooo soft – I only used it before bed though, even with really dry skin it makes you kind of shiny for an hour or so. I’ve been needing a new night cream lately so maybe I’ll give this a try! What a great concept! I have SUPER sensitive skin, so do you think this would be good for me? By the way, your pictures are really great. 😉 What kind of camera do you have? Thanks. I have sensitive skin as well, so I say yes! Thanks for compliment. I have a Canon Rebel Xsi SLR. This is such a great idea, thanks for posting the “recipe”. I am currently unemployed and have been stressed out thinking about gifts for the holidays but this helps me out so much. My mom, sister and grandmother won’t be expecting a gift of course but we are really close and I wanted to get them something regardless of my situation, this will be perfect. Thank you for posting it, it has made my night. I have all of the ingredients already so now I will just need to buy some pretty jars and print up some nice labels. If you have any other crafts or homemade gift ideas please feel free to post those too. Most of the ones I find call for several expensive things so I might as well just buy a gift but this is very economical. I’m so excited that you’re going to be able to use this recipe for gifts. Other homemade gift ideas that I have done in the past – a mason jar with all the dry ingredients to make cookies or other baked goods with a recipe card. Here’s a post about making them for blondies: http://ohsheglows.com/2010/11/14/project-food-blog-video-411/. I’ve also made homemade salt or sugar rubs and put them in nice jars for gifts. I already use olive oil when I need to moisturize my face, but this just sounds luxurious. I can already imagine how nice it smells. That’s it. Tomorrow I’m going to buy a pretty glass bottle, some fancy ribbon, and all the ingredients! This is a great idea. My daughter is really into natural. I think she will definitely like this one. I have some of those mini jam jars and will just use some pretty scraps of fabric to decorate the top. I love making gifts for Christmas so I can add this to my list of great ideas. This is for Christi – another great idea is making spice blends. Check for different blends on line, like Montreal Steak Spice. Buying spices in bulk at a bulk food store is really cheap and you can buy just as much as you need. In a nice jar, prettily decorated, is an great, inexpensive gift. I am making this one for my son who is away at University – macho decorated. This is also a great idea for anyone a sodium reduced diet – the fresh herbs and spices have more flavour and you can reduce the salt. Mine turned out a little grainy. Of course, it dissolves when you put it on. I was thinking of putting it in a mini-food processor to smooth it out. Do you have this problem? Is 2 1/2 T of cocoa butter equal to one stick? I don’t think it is, which makes the recipe complicated. I am going to melt one stick and measure it and adjust the recipe if it is not 2 1/2T. Finally, Rite Aid has the cocoa butter on sale for .99 (they say half price) right now. Hi Nancy! I’m glad you like the face cream. During the winter months when it’s a colder temperature in the house the cream does get hard and a little grainy so you have to rub it in your fingers before applying. Let me know if putting it in the mini-food processor makes it better! You’re correct, 2.5 T of cocoa butter isn’t one stick. I think 2.5 T is approx. 1/2 of the stick. Quick question. Do you grate the cocoa butter, or melt it, to measure it out? I melted it, but you could do either. I’m so happy I found this post! I’m still waiting for the butter and oil delivery to arrive, wanted to make a body butter from it (as seen here: http://www.onegoodthingbyjillee.com/2012/02/make-your-own-moisturizing-body-butter.html) but now I’ll have to save some for the face cream 😉 Thanks for the “recipe”! This is an AMAZING recipe! I’ve been looking for remedies for dry & sensitive skin! Thanks! I’m going to try this! My first acquaintance with coconut oil was when I was sailing in the South Pacific. The Tahitians had the most beautiful skin and hair. 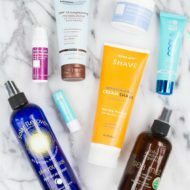 On becoming aware that sunscreen actually Causes skin cancer with all those chemicals in it, I researched alternative sunscreens and again and again coconut oil came up. I live in Africa. When I go into the sun or walk the beaches I put on coconut oil. I become lovely and brown and dont burn but of course I dont consciously try to sunbathe or roast my skin. For long periods in intense sun, which I can feel on my skin, I cover up. I read that as a sunscreen, it is best to allow the oil to be absorbed in the skin before going out in the direct sun. Just wondering i only have coconut oil and olive oil but not the cocoa butter! So, is it possible to use shea butter instead? .. Also is it fine to put this cream on my eye area? i’m in my mid 20’s.. Is it a night cream? because i like to put a cream in the morning but i’m afraid it’s not good, you know the sun heat ! I think shea butter would work fine! I use it near my eye area and haven’t had any issues, but be careful because it’s a sensitive area and might react differently with different people. And yes, I use it as a night cream. It’s a little heavy to wear during the day under makeup. hi! thanks for your post! btw, where did you buy your cute lil jars? The jar was from a sample of nut butter from Artisana. I’m not sure where you can buy them – maybe amazon? Not that anyone is as old as me . . . but I am 47 and use it as a day cream as well and love it! I can’t wait to try this blend! For my family we’ve been using coconut oil straight with a few drops of Young Living Lavender essential oil and this is so relaxing. Also in alergy season, having the lavendar helps with itchy eyes. Wonderful, so glad to have found your site. I just find your recipe! I ben looking since yesterday for a natural moisturizer, also Yesterday I spend $28.00. On a toner an a small moisturizer from Clinic. Since my skin is extremely sensitive this creams fell good, but to much money. I can weight to try it this recipe! I will save a lot of money since i am not working right know. Thank you so much for this post. Martha L.
I’m trying for the first time to make my own moisturizer. Everything went well until I tried to whip it, ( I don’t want hard or bar lotion) I thought I would try rose water and as I added it to the mixture while blending it, it turn instantly to a hard wax consistency. It smells great and would make an excellent lip balm:). How do I get it creamy like store bought lotions? Please help!! I bought all the ingredients a couple of weeks ago and was very excited to make it. I was just waiting for my shop bought one to finish. So today I have made it, I made it a 0900 and it is now after 1230 but is still has not solidified, it is still a liquid. If you put it some place cool (even the fridge if there’s no where cool in your house), it should get solid pretty quickly. Hope that helps! Thank you soo much for getting back to me soo quickly. I will do that now. Does it need to stay in the fridge one it had solidified? I did not have cocoa butter and used Shea Butter in this recipe. Will that work? Yes, shea butter should definitely work. How did the shea butter work out for you? I would like to make some of this now and only have shea butter on hand. Shea Butter worked great. I am very pleased with this night cream. It makes my skin feel so soft. I made it but it’s been oily all day!! i followed everything right..
uh, never mind i placed it in the fridge and it looks perfect..
Hi! Thank you for posting the recipe to make the cream. I’ve been searching for hours and days to find one. I made my face cream following your directions yesterday and it came out to be super hard (like a bar soap). Is it supposed to softer or is this normal? Thanks! It will be hard when at a cool temp. You can either store it in a warmer spot or rub your fingers on it to warm it up before applying. I hope this helps. I had HUGE eyebags! Then I remembered reading health benefits if coconut oul somewhere. I started using it around the eye area and have notedthat other people have stared telling me that I look younger and more well rested somehow, confirmation of my observations about my diminished eyebags! I have been combing the internet for testimonials in coconut oil/cream as a facial moisturizer. I’ll now give it a go after eading your and the others’ comments. Thanks! This looks simple enough, I’ve been looking up tons of recipes for a face cream, my question is can you add any oils to this for further benefit? If so, which ones would be good? Can you make this with jojoba oil instead of olive oil and can you add essential oils to it I guess is what I’m asking? Isn’t rose oil supp to be good? Any suggestions for my rosacea like skin? Wow this face cream sounds amazing! 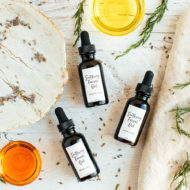 I literally only just realised you had some great homemade skin care posts! And here I was thinking Eating Bird Food was just about delicious recipes 😉 I will definitely be trying this. I think it’s easier if you put your container of coconut oil in warm water, the oil melts and you can measure it out much easier. Hope this helps! i have rosacea and everything irritates my skin. do u think this will be ok? hi! You said that this cream it’s a little heavy to wear during the day under makeup. If i replace the olive oil with sweet almond oil or apricot kernel oil or grapeseed oil it will be ok to use it during the day under makeup? I’m also interested if you have a recipe for a natural face cream with spf or a natural eye cream. I just made my first batch using the exact ingredients in the photo (I had all three). Only the EVOO is a different brand. The end result is not white or creamy – it’s golden color more like the Palmer’s Coco butter stick. I made it 11 hours ago and it is still predominantly liquid with a few congealed bits of white – probably the coconut oil. Did I do something wrong? I have not tried it on my face yet. I was all excited when I read about this cream so I made it. It did not agree with me as I found that when I washed it off in the morning my face felt dry and tight. I also noticed a patch of dry skin near my right temple. I now use pure coconut oil and I love it. It absorbs well and my skin looks healthy. I guess cocoa butter is not for me. Oh now! That’s such a bummer. I’m sorry the cream didn’t work out, but I’m happy to hear that regular coconut oil is working wonders on it’s own. I love coconut oil! Awesome recipe! Natural recipes leave your skin feeling much younger, fresher, and rejuvenated. I will be sure to share this moisturizer with others. Thanks! It felt great on my skin, but I genuinely hated the smell. Any idea how can I make it more pleasant to the ‘nose’. Obviously, the shea butter (which I put instead of the cocoa butter) in addition to the virgin oil can’t give you pleasing smell, but I’m pretty certain that something can be added to the mixture for a sweeter fragrance. Many thanks. Perhaps you could add some essential oils for a nice scent. I bet lavender would smell nice! I wanted to point out that many of Origins products have a toxicity rating of 4 or higher…some reaching as high as 9. You can buy it on amazon, just be SURE not to inhale the powder while infusing it with the lotion. Hi Marian, If you find this rcipe you’re looking for, would you kindly mail it to me as well. I’ve been searching all over for something simillar. options out there that I’m totally confused .. Any ideas? Bless you! How does this lotion work with acne prone skin? I have heard about oil cleansing and have thought to try it but I am so scared of a bad break out! I only use coconut oil to wash my face and moisturize. it works really well. put the coconut oil on your faceand let it steam in the shower then rinse with cool water. if you want a natural sunscreen then you could try shea butter. The smell is not all that good but if you mix with essential oils it is better. Hi I’m going to give this a go.. Do you use organic products? Or what are the best products to use? Also do you have any top tips on sunscreens? I know Shea butter Is a natural sunscreen but it doesn’t have a high enough factor.. Is zinc oxide ok to use or just another chemical?? Just wanted to let you know that coconut oil is a natural sunscreen with an SPF of 15. I came across this recipe and it helps to clear my son’s eczema. If you add a 1/2 cup of aloe vera gel you get a wonderful lotion! Just melt the oils and cocoa butter, cool and add to blender. Slowing add aloe and scrape down sides. If you stray from the recipe by adding more aloe or oil it won’t mix right. Thanks so much for sharing this recipe. I’ve been using just straight organic, virgin coconut oil on my face and body for about a month and I love it. I’d like to try this for my face, but the only Cocoa Butter I can find is very hard at room temperature, and it’s quite expensive, coming only in a large container. I can’t quite make out the name of the one you show–any suggestions of where it can be purchased? Online? Thank you!! raw cocoa butter is hard, use the double boiler and warm it up to liquid form, when mixed with other liquids it remains softer. A nice recipe, pls I want to know if it is advisable to add green tea to it. Hi! would I be able to use shea butter instead of cocoa butter? Hi Nadina. I think that should work fine. I tried this cream, and I love it! I added a few drops of Vitamin E oil and lavender essential oil. I have been using coconut oil on my face at night for a few months, and it’s been great for my combination skin. So far, this recipe seems like an even better moisturizer. Thanks for sharing! PS – I hope you don’t mind – I posted this recipe on my blog (http://meetmissmarie.blogspot.com/) and cited your original post. Thanks for posting! I have dry in my face.. sensitive skin too, plz help me here ? so can I try this …? I am so excited to try this recipe! thank you so much! im wondering if i could possibly add less cocoa butter (for smoother more liquid lotion like consistency) and switch the olive oil for a carrier oil blend… do you think it would work? perhaps if i put it in the blender? I’ve been using coconut oil for several months now and absolutely love it especially as a facial moisturizer. I have noticed that sometimes the coconut oil tends to leave my skin just a little tight, so I’m looking forward to trying this recipe! Does it matter what kind of coconut oil you use? I have the cooking one would it make a difference? Hi Natalia – I’d just make sure it’s extra virgin coconut oil. Amazing! I added some Vitamin E Oil. Thank you loads!! Did you know carrot oil naturally protects against UVR. Maybe try mixing some in the facial cream for the daytime! Great tip! I’ll have to look into adding some to my day cream. Does this need to refrigerated once made? I ran across this recipe a few day ago. I have very sensitive skin and can not use most brands on the market. I made this two days ago and can’t believe how soft it makes my hands and face. Today I started using it on my dry legs. I love it. Thanks so much for posting it. Wld it be ok to substitute Sweet almond oil for the olive oil because I’m out of olive oil? Also my 11 yr old son has very sensitive skin & always has a rash somewhere. I’ve had to start making our laundry detergent and was wondering if you knew of any recipes for body wash and deodorant that’s good for skin problems. Every deodorant we try gives him the most awful rashes that dr’s cldnt figure out so said for him not to wear deodorant for now but a very active 11 yr old that sweats ALOT lol needs something. So I’ve been looking into doing things the natural way. Thanks for sharing this recipe. I’m about to give it a try right now. Wish me luck! If this is used more less for a moisturizer then what about a DIY face wash? Any recommendations? Has any tried to add green tea and oatmeal to any of this recipes? No, I haven’t tried adding anything to the face cream, but I love the idea of adding green tea or oatmeal! I meant has anybody, sorry!